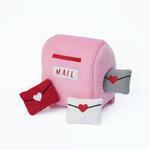 Show your dog you care this valentines day with the ZippyPaws Burrow Dog Toy - Mailbox And Love Letters! The ZippyPaws Burrow Dog Toy - Mailbox And Love Letters is a fun interactive dog toy that is perfect for valentines day or any dog or owner away from home! Stuff the love letters in the mailbox and let the fun begin. Dogs will bury their nose to retrieve the letters and then they can create a game of fetch or be put back in for endless fun! Its soft plush and fun squeakers will keep your pup engaged in play. One Size: 6" x 5" x 5.5"
Just love this site, so much to choose froma nd the products are great.